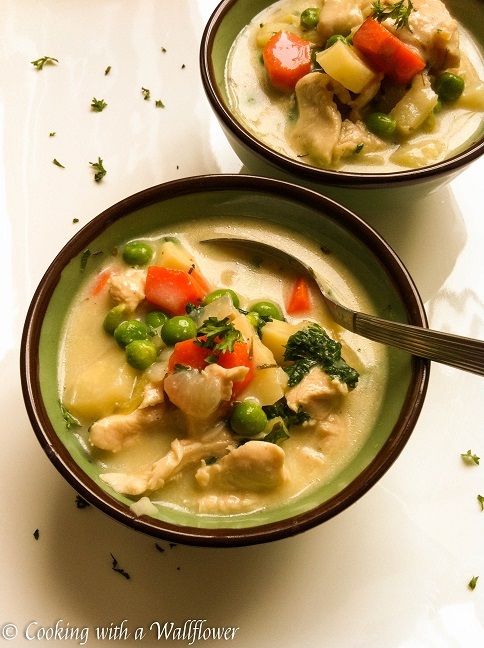 Seasoned with the aromatic flavors of thyme and nutmeg, this creamy chicken pot pie soup, loaded with tender chicken and vegetables, is the perfect alternative to chicken pot, especially for winter. 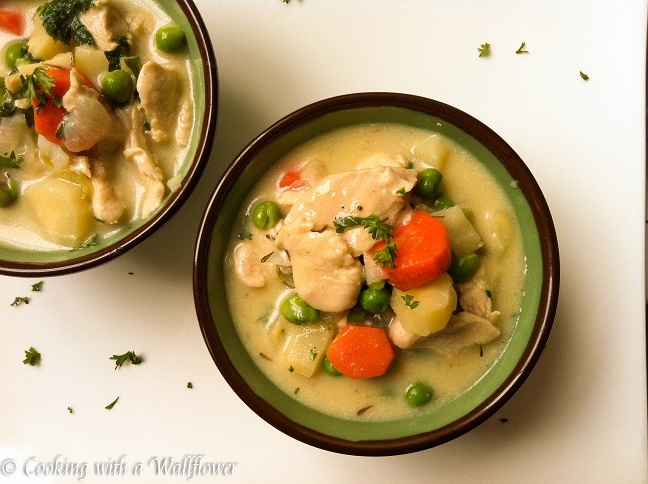 Creamy Chicken Pot Pie Soup is perfect for those who love the filling of chicken pot pie. As much as I love flaky buttery crust with my pies, sometimes I just want more of that amazing chunky filling. My solution? This soup, of course. And before I forget, there’s still time to enter the $25 PayPal Cash and 2015 Blog Planner Giveaway. It runs until 12/16. It’s perfect for the wintery cold season. 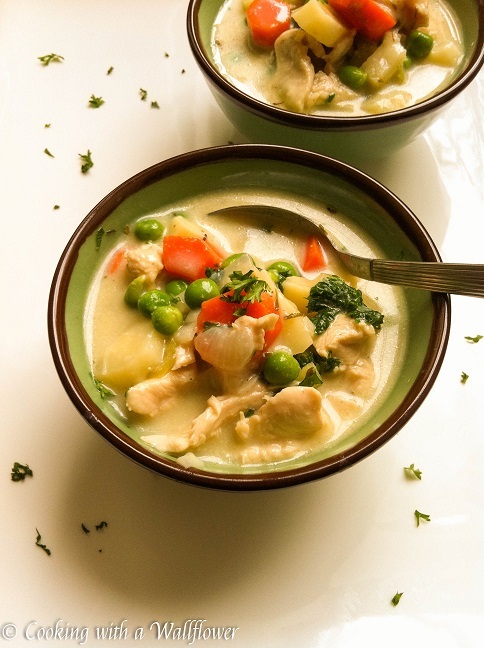 The creaminess, the tender chicken, the delicious vegetables, the refreshing parsley all there in one deliciously warm soup. Can you just imagine that very first bite? Savory and oh so very amazing, you’ll want the whole pot to yourself. 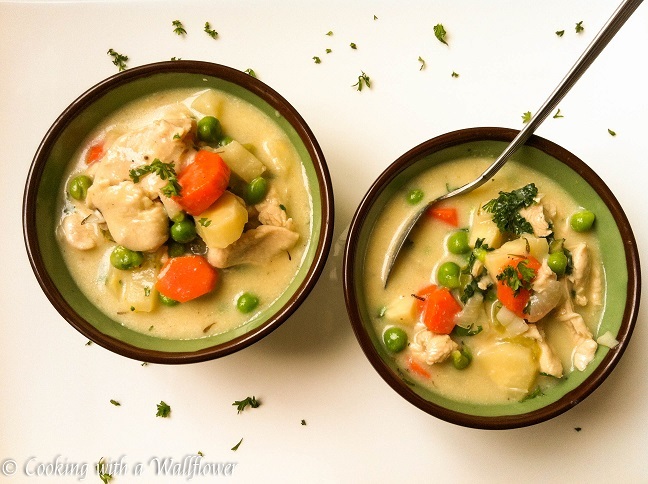 Loaded with chicken, parsnips, celery, carrots, and peas then garnished with fresh parsley, this soup has so much texture and flavor. You’ll love it during the fall, especially with that turkey, but you’ll definitely appreciate it during the cold winter days. If that doesn’t convince you, this soup takes less than 30 minutes to make and requires just one pot so it’ll be easy to clean up afterwards too. Something I’ll really appreciate when I’d rather be snuggling on the coach with a warm blanket watching movies. First, add the vegetable oil to a medium sized pot over low heat. Add minced garlic, and stir with a spatula to cook the garlic evenly. Be careful not to burn the garlic, which trust me, I’ve done many times before. 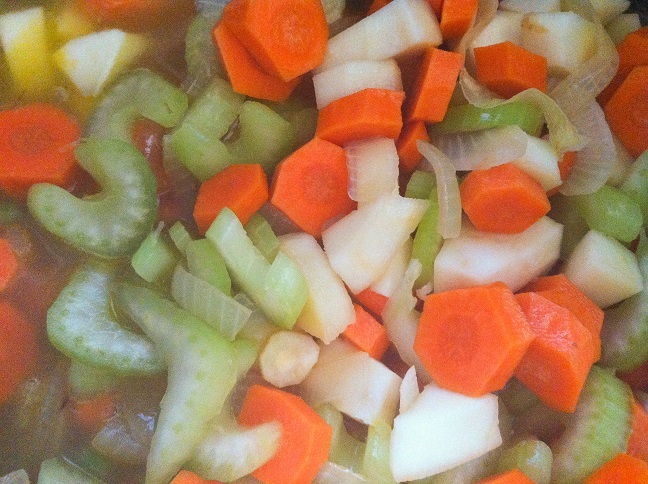 Once the garlic starts to turn brown on the edges, add the sliced onions, carrots, parsnips, and celery. Cook these vegetables until they’ve started to soften, about 5-7 minutes. Pour about a cup of the chicken broth into the pot, then add the dried thyme, nutmeg, and salt. Stir to evenly season the soup. Cook for another 5-7 minutes until the vegetables are tender. Add the peas and chicken, cooking them for about 5 minutes. 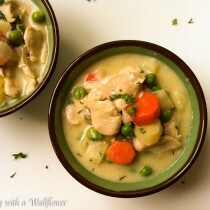 You want to add the peas and chicken at the end so that they don’t become overcooked. In a medium sized bowl, mix together the flour and the rest of the chicken broth until the flour has dissolved in the chicken broth. This will be the thickener for your soup. Slowly pour the flour and chicken broth mixture into the pot, stirring as you pour to make sure that the mixture is evenly incorporated into the soup. If you don’t stir, the flour could clump up in one section and form a gooey substance. Lastly, pour in the milk to create the creaminess. Stir to evenly incorporate the milk. Garnish with chopped fresh parsley. Serve the soup warm. In a medium to large sized pot, add the vegetable oil over medium heat. Add the minced garlic to the pot and cook the garlic until it starts to turn golden brown on the edges, about one minute. Next, add the onions, cooking them until they begin to soften. Once the onions have softened, add the carrots, parsnips, and celery. You want to add vegetables that take longer to soften first. Pour about a cup of chicken broth into the pot over high heat, reserving the other cup for later. Stir in the dried thyme, nutmeg, and salt. 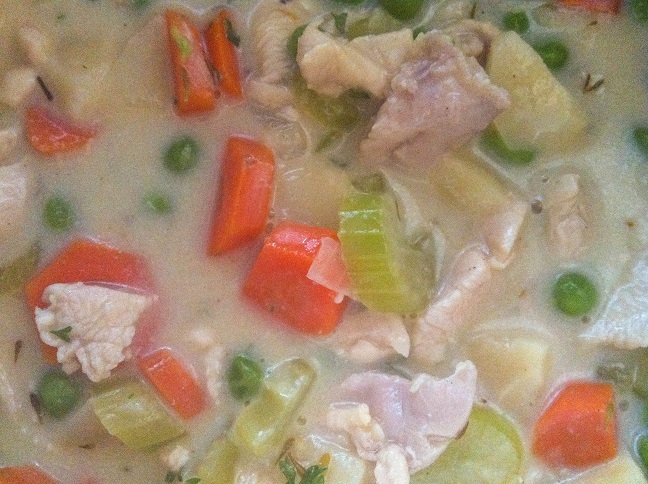 Once the carrots, parsnips, and celery are soft, add the sliced chicken and the peas. You want these two ingredients to be added later so that the chicken doesn’t become overcooked and the peas don’t lose its vibrant green color. Mix together the flour and the reserved chicken broth until the flour has dissolved. This mixture will serve as a thickener for the soup. Slowly pour the flour and chicken broth mixture into the soup, stirring as you add to make sure that it is evenly incorporated into the soup. Lastly, pour the milk and stir to create the creamy texture of the soup. Make sure to add the milk last so that it doesn’t curdle. Remove the soup from heat and divide them into four bowls. Top the bowls with fresh parsley. 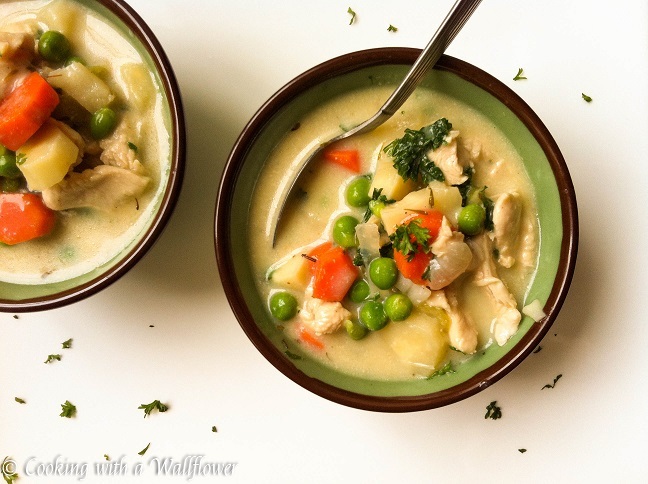 This entry was posted in Quick and Easy, Recipes, Soup, Winter Cravings and tagged quick and easy, recipe, soup, winter cravings. Oh my this is amazing! I love soup and chicken pot pies! I am going to have to try this. Your recipes are awesome and I feel like I will be spending a lot of time in front of the stove now! I hope you’ll like this recipe, Kourtney! Looks really delicious 🙂 Bookmarked to try soon! Thank you so much for linking my post! I really appreciate it! Pingback: This Week’s Favourites | Living Life to a "T"
Hmm I’ve very tempted ! This looks lovely and what a lovely picture as well!